Thanks to Nikon's overall optical design, coupled with industry-acclaimed chromatic aberration-free optics, the YS100 produces image that are needle-sharp and of high contrast, including the periphery of the viewing field. In addition, the prism-type eyepiece tube and high-output 6V 20W halogen light source provide bright image. A: Prism-type binocular eyepiece tube with advanced compensation feature that corrects the diopter in both the right and left eyepiece lenses. B: An internal click-stop mechanism makes rotation smooth, while increasing durability. C: The condenser comes with an aperture diaphragm with position guide markings for the 4, 10, 40 and 100X objectives to make operations quick and easy. D: The double-plate mechanical stage provides ample space on the stage to facilitate easy specimen handling. E: The focus knob and the stage handle are situated at an optimum position, allowing for a natural operator posture without twisting the shoulders. F: Powerful 6V-20W halogen light source is used. Lamp exchange can be made easily. Thanks to Nikon's anti-mold paint and tablets, mold is no longer a problem. 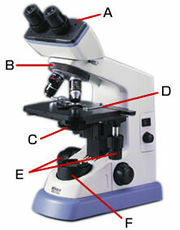 In laboratory tests, mold did not form for up to five years, even at a 30° temperature and 80% humidity.